A new 42-unit condominium project on the Shark River, with a marina, was presented to the Neptune Township Committee this week night for preliminary approval. The Planning Board wuld have to amend the area’s mixed-use site plan to allow for the residential use. Called Marina Pointe, the property is owned by Coast Cities Truck Sales President Douglas M. Gallagher, who said he originally bought the property 18 years ago as a site to park trucks but that it was never developed for various reasons. He called the project “shovel-ready to go,” if approved. The one-acre site, located on the Shark River off Concourse near Route 35, is the site of the former Polo Club, which was demolished many years ago. The new three-story building would have one- and two-bedroom units with parking on the first level. 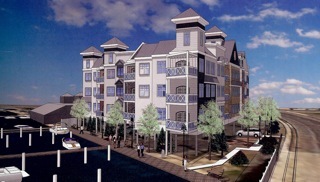 It would also have a marina on the Shark River and a roof-top patio. The Marine Pointe project will need the Planning Board to amend the use in the zone to allow for the residential project and the Township Committee asked for more detailed information. Township Attorney Gene Anthony said a sub-committee needs to be formed that can make a recommendation to the Planning Board, with input from the township planner. Planner Christine A. Nazzaro-Cofone, based in Red Bank, said the project provides a good residential use and improve the aesthetics in the area, adding that a residential stock will help bring in other uses. “Some economic development in this area is beneficial. You have a great project before you,” she said. “I am excited to see this come forward. We should look at all redevelopment projects and get them going,” Committeeman Michael Brantley said. ← The Zombies Are Coming!